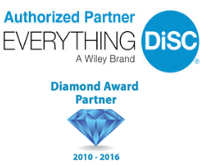 The DiSC reports from Wiley Publishing can be used to help you conduct ongoing training within your organization or can be used by consultants who would like to use the DiSC instrument with their clients for teambuilding sessions and workshops. The certification will help you become proficient in using the DiSC instrument. You will need to purchase or have access to an Everything DiSC Workplace Facilitator Kit for the online certification class. It is required to participate in the course. Passing score on the final exam. Use of a laptop or desktop computer (Mac or PC) and a phone line for audio are required. This course does not support use of tablets or VOIP.